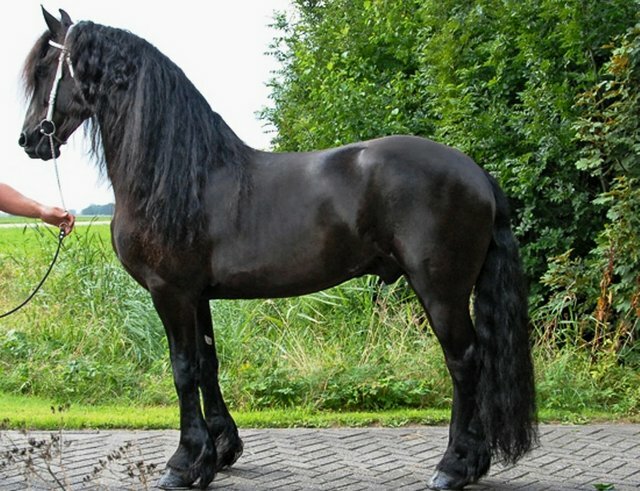 The black Friesian horse is the only horse breed native to the Netherlands, where the Friesian has been known since as far back as the 13th century. 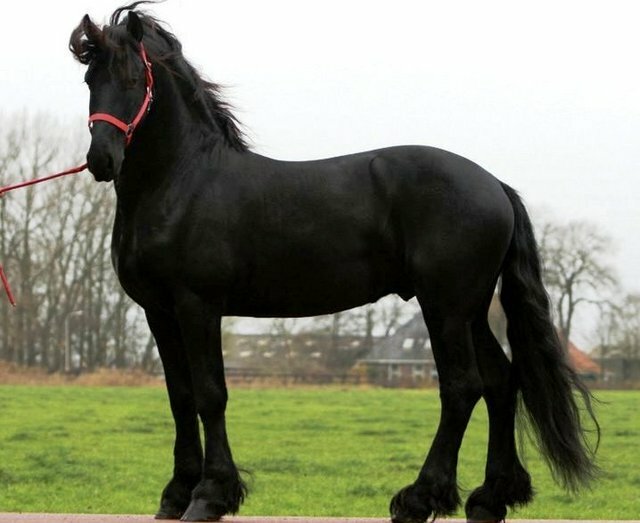 A consistent breeding policy has produced the black Friesian horse we are familiar with today, exhibiting the unique characteristics of the breed and continuing to bear close resemblance to its ancestors. Typical of these Black Pearls (Sterling) are the front, the majestic mane and feathering of the lower legs, the jet black colour and the spacious, powerful elevated gaits. The harmonious build and the noble head, set on a lightly arched neck, complete the aristocratic and fiery appearance. Its amicable character is the key to a great utility breed. Midway through the last century the black Friesian horse was used mainly as a harness horse in farming operations. These days Friesians are again being kept, but for purposes of recreation, breeding and sports, and often for some combination of these objectives. 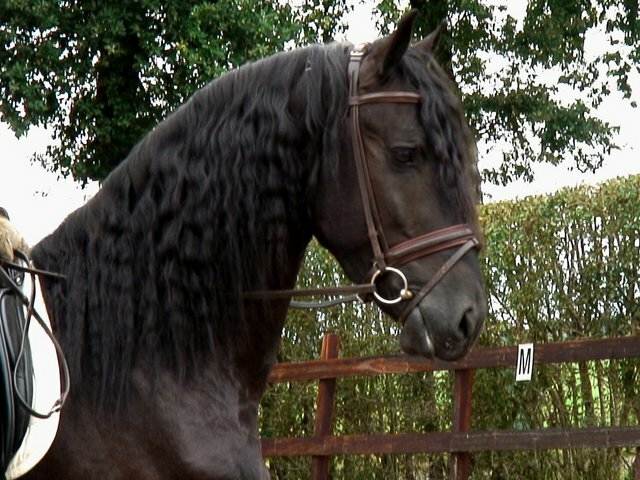 The Friesian is often seen in the dressage ring and in driving sports. There is a close relation between an animal’s intended use and its exterior. The horses that were bred for use in agriculture were more short-legged and compact than their ancestors, with forelegs a bit behind the vertical and a broad chest. With this broad chest, the horse was better able to throw itself ‘into the harness’ and in so doing develop more pulling power. These exterior characteristics are less functional these days in the riding arena or in harness and driving horses. Nonetheless, the heavier and short-legged type is still much in evidence, partly because this type was bred for so many years and multiple generations are needed before it disappears from the breed. For work under the saddle and driving sports a functional build is key. The horse’s body must have an ‘uphill’ slope. With this ‘uphill’ build, the distribution of weight is brought more onto the hindquarters in motion, enabling the horse to ‘carry’ more with its hindquarters. For an uphill build, a relatively long foreleg is important, as well as the stance of the foreleg. The stance of the foreleg is linked to the shoulder, whereby an angled and long shoulder provide the horse space to extend its foreleg far out to the front. The harness horse often has a bit more vertical neckline than the riding and driving horse. For animals of all purposes, the horse must move fluidly through its entire body, with a powerful hindquarters that transmits movements forward, enabling the horse to ‘grow’ in front, a desired trait for both riding under the saddle and for driving in front of the wagon. For harness horses a lot of knee action is desirable (but not this alone, as it must be combined with spaciousness of gaits and a ‘carrying’ hindquarters), while for riding horses and also driving horses, extravagant knee action is not always appreciated. For all purposes, a correct leg stance is a must. 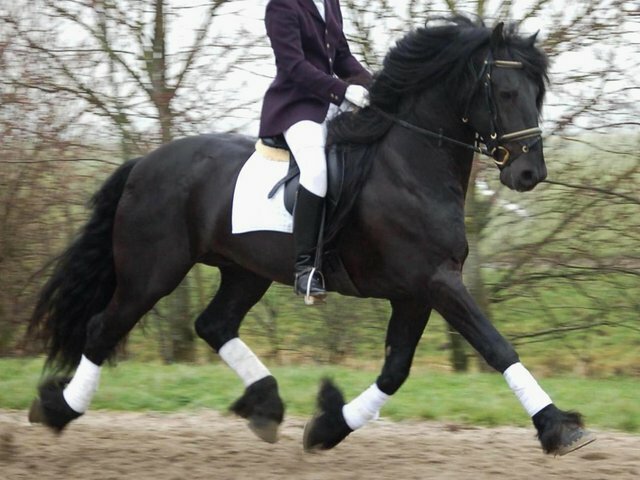 The black Friesian horse has increasingly developed itself as a sports horse over the past decades, in so doing in fact returning to its origins before the agricultural interlude. 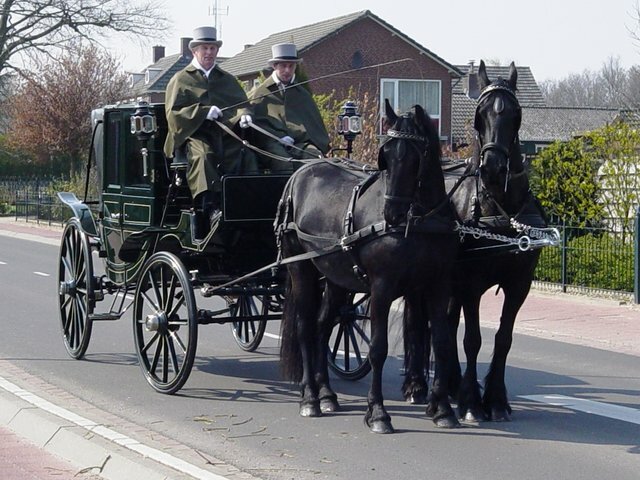 The Friesian’s origin is of a luxuriant and aristocratic carriage horse. 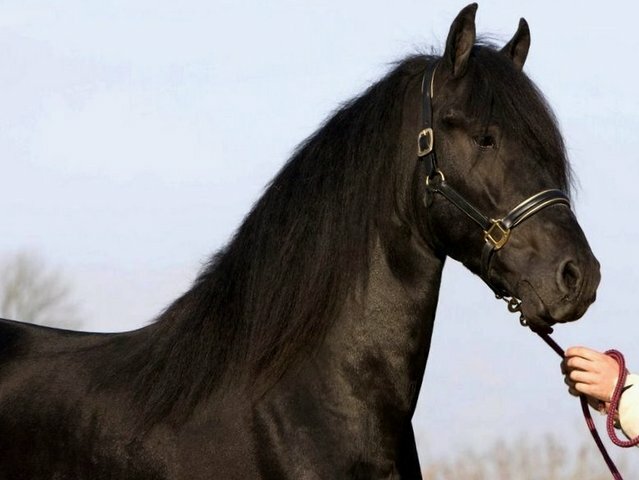 Today, thanks to its typical functional characteristics, the Friesian horse now competes with other breeds at the highest levels of equestrian sports. The Friesian horse has a talent for dressage. The foundation lies in his intelligence, willingness to learn, and readiness to perform. 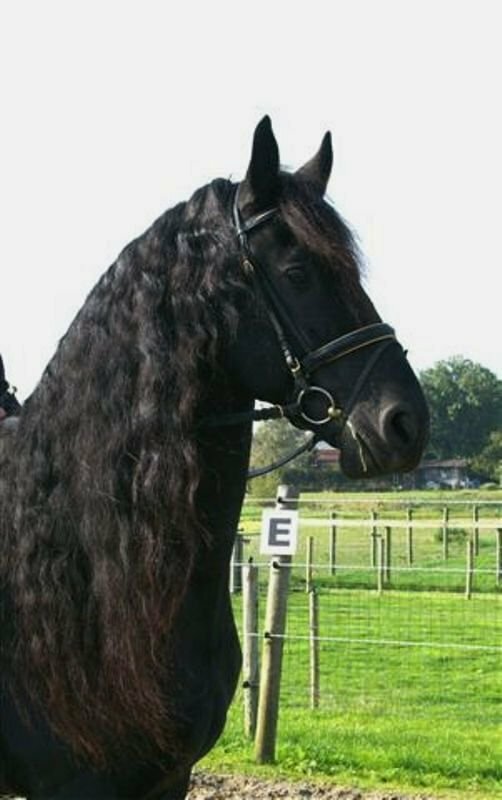 His pleasant character and his gentleness make the Friesian an attractive mount for competition as well as for recreational purposes. 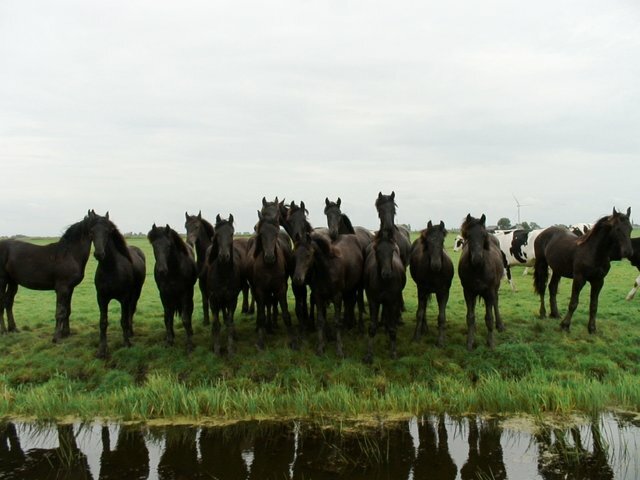 The riding club "De Oorsprong" (the source), from Huis ter Heide near St. Nicolaasga in Friesland, has been using only Friesian horses since 1937 in order to advertise their abilities as riding horses.